Swayambu Stupa: It is said that the history of the Kathmandu Valley began with Swayambu, "selfcreating". According to legends, the Buddhist saint Manjushree came across a beautiful lake during his journey in the Valley. He discovered a lotus that emitted brilliant light at the center of the lake. So, he cut a gorge in the southeastern hill (known as Chobar gorge) and drained the water to worship the lotus. People settled in the dried up lake and called it Kathmandu , while the hilltop of the selfcreating Lord has become a holy place. The Valley being a lake bed is actually not only a fable, but a geologic reality. Clay mines and rich soil bear evidence of the valley's under water past. Swayambu is not only the major landmark of the Valley but also one of the best places to observe the religious harmony of Nepal . Ancient mini stupas and shrines of both Bhudhists and Hindus fill up the stupa complex. This stupa is among the most ancient in this part of the world and its worshippers are diverse. A monastery adjecent to the stupa houses the largest image of Sakyamuni Buddha in Nepal and many stone sculptures of different deities. There numerous monasteries in the vicinity of the stupa with huge prayer wheels, fine Bhuddhist paintings, and special butter lamps which can be lite after offering a monetary donation. 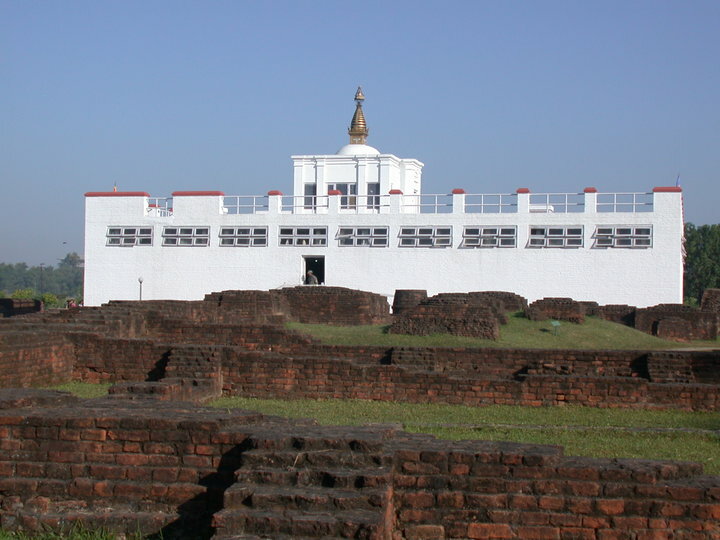 Since we will not spare time to visit all the monasteries, we will visit the main monastery in the stupa complex. On a clear day, this hilltop stupa complex offers excellent views of the Kathmandu Valley and the towering snow-capped peaks in the background. Evening-Nepali dinner and folk cultural show or at leisure. Early morning breakfast, drive to Pokhara, check into hotel, refresh and Go for a short boat trip on Phewa Lake . Kathmandu to Pokhara by road takes about 7 hours and is a scenic as well as a pleasant drive. Meals:(BLD). Early morning breakfast, and drive Lumbini via Tansen and Palpa to Lumbini. On arrival, check in at Garden Hotel, afternoon tour of Lumbini. Overnight at hotel.Meals (BLD). Day 5 Lumbini Tour and flight to Kathmandu . Breakfast at hotel, and depart for Lumbini tour in the morning. The tour consists of visits to Buddhist monasteries and ruins of the ancient kingdom where Sidhartha Gautama Buddha was born and spent his formative years. Lunch en-route tour and afternoon flight back to Kathmandu . Upon arrival, transfer to hotel, check in and at leisure. Meals:(BLD). Day 6 Bhaktapur, the city of Devotees, and Nagarkot Hilltop. At an elevation of 2,099 meters above sea level, this mountaintop, rural resort town is ideal for viewing spectacular sun rises and sun sets over the high Himalayas . On a clear day, Mt. Everest and many of the other world famous peaks can be seen from here; also beautiful layout of the Kathmandu Valley below. Overnight in Nagarkot or Kathmandu : Meals:(BLD). Breakfast at the hotel and transfer to Kathmandu Airport for departure Meals: (B).